There is not one single size that fits all European union/Schengen countries EU Visa applications. The Schengen Visa Photo size can be 50 mm x 50 mm (or 45 mm x 45 mm, or 35 mm x 45 mm ). So please refer to your application form or the consulate you are going to submit your Schengen Visa application and let us know what size they exactly need and provide us that info along with your order by sending an e-mail to . Two identical photos. Not older than six months. Head should take 70-80% of the photo. Brightly colored background. Light grey is suggested.No patterns. The applicant should be looking straight at the camera. Avoid uniforms or colors matching the background. You must not wear any headwear (Rule has exceptions for certain credible religious reasons). Photo must be high-quality and professional. Schengen visa photo requires that it clearly shows your facial features from the tip of your chin to the crown of your head as well as your left and right sides of your face. 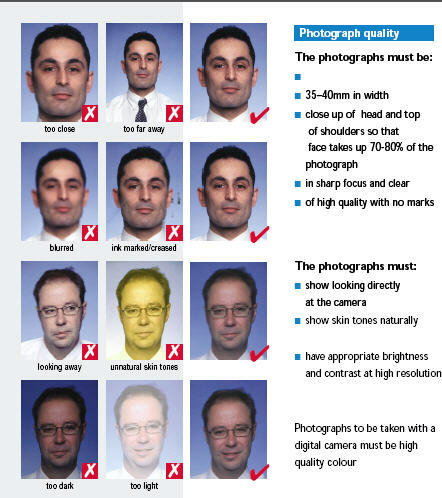 Your face must fill around 70 to 80% of the photo-face must be somewhere between 32 and 36 mm high. Red eyes must be avoided. IMPORTANT: We find variations in Europe Visa/Schengen Visa Photo Size requirements so please let us know the photo requirements mentioned in your application form in an e-mail to after you place an order. General Consulate of France in Houston requires 35x45 sized photos. Click here for samples on their website.